An estimated 224,390 new cases of lung cancer will be diagnosed in the United States in 2016, according to the American Cancer Society.1 There are two main types of lung cancer, non-small cell lung cancer and small cell lung cancer. Small cell lung cancer (SCLC) will account for 12 to 15% of all new lung cancer diagnosis. It is important that all patients with lung cancer know what type of cancer they have because the treatments for each type of cancer are different, and treatment for one type may not be effective for another. This chapter will review the approach to small cell lung cancer. See Chapters 2, 3, and 4 for the treatment of non-small cell lung cancer (NSCLC). The typical patient with small cell lung cancer has a history of smoking but may be a current or former smoker of either gender, usually in the seventh decade of life. Patients may have symptoms, signs and laboratory test abnormalities caused directly by the primary tumor, those related to spread of tumor within the chest cavity or distant spread, and those related to paraneoplastic syndromes.2-3 Patients may present with symptoms of shortness of breath, cough or chest pain due to disease in the chest. For patients with disease outside the chest, symptoms may depend on location of spread such as bone pain with bone metastases or headaches and dizziness in patients with CNS disease. Constitutional symptoms may include weakness, loss of appetite, weight loss or fever.3-5 Apart from the brevity of symptom duration, these parameters fail to clearly distinguish SCLC from NSCLC. Before starting on treatment it is important to have a biopsy to confirm the diagnosis of small cell lung cancer. A biopsy is when a piece of tissue is taken and examined under a microscope. The type of biopsy performed depends on the location of the tumor. through the mouth or nose and pushed into the lungs. This procedure may be used to sample the lungs or a lymph node within the chest. An ultrasound may be used in a procedure known as endobronchial ultrasound (EBUS) to assist in the procedure. through the skin to obtain a piece of tissue. placed into the chest and fluid is removed. The fluid is sent for evaluation of cancer cells. Although it is not common, if there is not enough tissue in the original biopsy, a second biopsy may be required. Once a diagnosis is established, radiograph imaging studies will be performed to determine the location of the cancer within the body. The purpose of the testing is to stage the cancer, determine if treatment will be curative or if cure is not possible. Some of these tests may have been done prior to the biopsy and may not need to be repeated. Figure 2. CT scan of the chest and abdomen with a cancer in the left lung. Magnetic resonance imaging (MRI) of the brain: this test is done because small cell lung cancer may spread to the brain. Some patients cannot have an MRI scan and a CT scan of the brain may be done instead. Bone scan: this test is done because small cell lung cancer may spread to the bones. Figure 3. 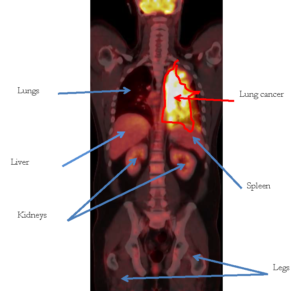 Positron Emission Tomography (PET) scan which shows involvement of cancer in the left lung. Before starting treatment for lung cancer, blood tests are needed to evaluate how different organs in the body are working. The results may impact what treatment is prescribed. These tests are described below and are commonly performed in most patients with a cancer diagnosis and may be repeated regularly during or after treatment. Liver tests: alanine transaminase (ALT), aspartate aminotransferase (AST), alkaline phosphatase, and bilirubin. Electrolytes: sodium, potassium chloride, phosphate and magnesium. Stage is an indication of the size and location of the cancer. Approximately 60-70% of patients are diagnosed with small cell lung cancer will have extensive stage disease at presentation. Although there is a shift in recommendations for the staging of small cell lung cancer most patients are still diagnosed using the traditional staging system of limited stage disease and extensive stage disease.6 Patients with limited stage disease have cancer confined to the lung that can be treated with a combination of chemotherapy and radiation therapy and the goal of therapy is generally cure. Patients with extensive stage disease have cancer that has spread within or beyond the lung and the cancer may not be cured with either chemotherapy or radiation therapy. 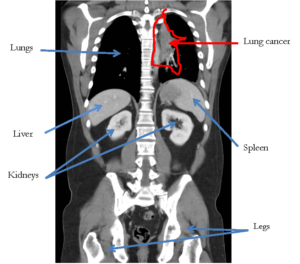 The Tumor-Node-Metastasis staging system is a newer system also used to stage small lung cancer. Using this system, small cell lung cancer may be staged as one of four stages, stage I, II, III which are similar to limited stage disease and stage IV which is the same as extensive stage disease. Staging is imperative to know prior to embarking on treatment. Endobronchial ultrasound biopsy (EBUS) as mentioned above is a procedure where a tube is inserted through the mouth or nose into the airway and an ultrasound device is used to help identify lymph nodes that will be biopsied. Mediastinoscopy is a minor surgery where a small incision is made at the bottom of the neck a camera is placed into the anterior chest to identify lymph nodes to biopsy. If surgery is performed to remove the tumor from the lung, chemotherapy is recommended once the patient has recovered from surgery to treat microscopic disease, cancer cells that may be present but are not able to be seen with any imaging or the naked eye. If lymph nodes are found to be involved at the time of surgery it may be necessary to have radiation after surgery as well. Due to the extensive and infiltrative nature of small cell lung cancer, surgery has not traditionally been a part of small cell lung cancer management. In fact, only about 5% of small cell lung cancer patients are actually considered to have Stage I small cell lung cancer. Surgery is now only considered for Stage I, (T1-2, N0, M0), who have undergone sampling of the mediastinal (mid-chest) lymph nodes to prove that these are not involved. 7 Small cell lung cancer cases that are beyond Stage I (T2, N0, M0) that have no distant metastases (spread to another organ outside the involved lung), are typically treated with both chemotherapy and chest radiation. Combined chemotherapy and radiation therapy is recommended for most patients with limited stage disease. A medical oncologist will oversee the chemotherapy and radiation oncologist will oversee the radiation therapy during the treatment. Smoking cessation is very important prior to starting on therapy. Several studies have suggested that patients who stop smoking during therapy have higher chances of cure and living longer compared to patients who continue to smoke.8 Patients can ask their doctors for resources to help them quit smoking. Additional information is available by calling 1-800-QUIT NOW , reviewing www.smokefree.gov or Chapter 11: How to Quit Smoking Confidently and Successfully. Chemotherapy remains the backbone in the treatment of patients with small cell lung cancer. 7 Even patients who have surgery to remove their cancer will require chemotherapy once they have recovered from surgery. A platinum combination, either cisplatin or carboplatin plus etoposide is the most common chemotherapy regimen for the treatment of small cell lung cancer in patients in the United States.9 This regimen is given over 3 days every 3 weeks. Each 3-week period is called a “cycle”. In between each cycle the body recovers from the side effects of chemotherapy and gets ready for the next treatment. Chemotherapy for limited stage disease is usually given for 4 cycles, two cycles with radiation therapy and two cycles without. Chemotherapy is given through a needle that is interested into the veins. Some patients may have an IV inserted directly into the vein that can be removed each day at the end of treatment, other patients may require a peripherally inserted catheter (PICC) that is placed in the vein and remains in the vein during treatment or a PORT. The platinum and etoposide are both given on the first day and may take anywhere from 4-6 hours because of additional fluids and medications given prior to chemotherapy, etoposide is given on its own on the second and third day and may take about two hours to administer. Most people do not feel anything unusual while receiving chemotherapy. However, side effects may occur after chemotherapy is given. Increased risk of infection: this is one of the most serious side effects of chemotherapy. Any patient with a fever, during chemotherapy needs to seek immediate medical attention. breath, pain with urination, diarrhea, or ear pain among other symptoms. The increased risk of infection with chemotherapy is because chemotherapy kills white blood cells, which defend the body against infection. However, white blood cells grow back between each cycle. As a matter of precaution it is important for patients to wash their hands regularly, avoid large crowds and sick people and eat food that comes from a trusted source. Fatigue: Both chemotherapy and radiation therapy may cause fatigue. This is normally the worst the first few days after chemotherapy and usually improves during the second and third week of each cycle. Fatigue can accumulate with increasing cycles of both chemotherapy and days of radiation therapy. Fatigue typically improves once therapy is completed. Nausea and Vomiting: These are both less common with the recent use of potent anti-nausea medication. Medication may be given with chemotherapy and to take home as a preventative or to use as needed. This may include aprepitant or fosaprepitant which are given with chemotherapy as well as ondansetron, granisetron, dexamethasone, promethazine, prochlorperazine, metoclopramide and lorazepam which may be given with therapy or to take at home. Hair Loss: Hair loss typically occurs within 3 weeks of starting chemotherapy. Hair often starts to come back about one month after completing chemotherapy but is delayed in patients who are treated with radiation to the brain. Other Side Effects: Other side effects of therapy include mouth sores, loss of appetite, diarrhea, easy bruising and bleeding, dehydration and damage to the kidneys, ringing in the ears or numbness and tingling in the fingers and toes. All side effects should be discussed with an oncologist. See Chapter 7: Supportive Care. The techniques of radiation therapy for the treatment of limited stage small cell lung cancer are similar to what is done for what is done for Stage IIIA to IIIB non-small cell lung cancer. The same team approach is used in consultation, simulation, treatment planning, patient education, treatment delivery, and quality assurance. See Chapter 4: Radiation Therapy for Non-Small Cell Lung Cancer for additional technical details. Side effects of chest radiation in small cell lung cancer is similar to chest radiation in non-small cell lung cancer. Acute side effects occur when a patient is receiving lung radiation therapy with or without chemotherapy. These include redness and irritation of the skin overlying the radiation treatment portals; inflammation of the esophagus (esophagitis) causing heartburn or a feeling that something is stuck in the throat; irritation of the lung causing a dry cough; inflammation of the sac surrounding the heart causing chest pain (pericarditis); electric shock sensations in the low back or legs when bending the neck (Lhermitte sign); and generalized fatigue. These acute side effects typically resolve 2 weeks after completing chest radiation therapy. Subacute side effects occur 1 to 6 months after completing radiation therapy. These side effects are less frequent and may include radiation pneumonitis, which is inflammation of the lung that causes chest pain, fever, and cough.13 As mentioned above in the section on treatment planning, radiation pneumonitis occurs infrequently, especially when the V20 (volume of both lungs receiving ≥ 20 Gy or 2000 cGy) is no more than 35%. Your radiation oncologist, dosimetrist, and physicist work hard to ensure that the least amount of radiation possible goes to normal lung without sacrificing coverage of the lung tumor. Treatment of radiation pneumonitis includes corticosteroids such as prednisone or dexamethasone. Long term side effects of lung radiation therapy include pulmonary fibrosis (permanent scarring of the radiated lung tissue), esophageal fibrosis and stricture (scarring and narrowing of the esophagus that causes difficulty swallowing and treated with esophageal dilation), constrictive pericarditis (shrinkage of the sac surrounding the heart, that may require surgical removal), and damage to the heart muscle and blood vessels that may increase the risk of heart failure and heart attack. These long term side effects are uncommon because modern radiation therapy techniques have resulted in better sparing of normal tissues and organs. Excerpted from Chapter 4: Radiation Therapy for Non-Small Cell Lung Cancer. Because the risk of brain metastases in small cell lung cancer is so high, MRI of the brain with contrast is part of the staging workup for limited stage small cell lung cancer. Prophylactic cranial irradiation (PCI) is a standard treatment for patients without brain metastases on MRI to lower the risk of developing brain metastases (59% to 33% over 3 years in limited stage).14 The standard dose has been 2500 cGy given in 250 cGy fractions over 10 treatments. PCI includes the entire brain (like whole brain radiation) but also includes the spinal cord down to the level of the C2 vertebra. After therapy is completed, patients are followed regularly until they have recovered from all side effects. The majority of side effects usually start to improve about four weeks after completing chemotherapy with more energy and increased appetite. However, prophylactic cranial irradiation which starts about a month after chemotherapy is complete may delay recovery. Late side effects may occur such as inflammation of the lungs or other side effects from radiation. For this reason, it is important to tell the doctors about any new symptoms that occur after treatment has ended. Regular visits are recommended with a medical oncologist every one to two months initially, and then less frequently if the patient is feeling well. At every visit the doctor will review symptoms and perform a physical examination. A CT scan of the chest and blood work will be done every two to four months initially, every four to six months later and annually after three years. The intention of treatment for limited stage small cell lung cancer is to cure the cancer. It is expected that 70-90% of patients that receive therapy will have a response, with the cancer shrinking. However, there is a high risk of recurrence and only 25% of patients are alive at five years. For patients who do not wish to receive treatment or are unable to receive treatment the expected survival is lower. Patients with extensive stage small cell lung cancer have cancer that has spread either within or beyond the lungs. Chemotherapy is the backbone of therapy, with or without radiation. Surgery is generally not recommended. Similar to patients with limited stage disease chemotherapy consists of a platinum doublet cisplatin or carboplatin with etoposide in North America and Europe. Chemotherapy is given over 3 days with platinum and etoposide given on the first day and then etoposide alone on day 2 and 3. Treatment is given through a vein using either a needle inserted into the arm or a PICC or PORT as described above. Treatment is generally given as an outpatient and may take 4-6 hours the first day and then about two hours on day two and three. Prior to treatment on the first day blood work is done to make sure it is safe to give chemotherapy and you will likely meet with your medical oncologist or a member of the health care team. Treatment is usually given in a 21-day cycle. In between each cycle the body recovers from the side effects of chemotherapy and gets ready for the next treatment. Chemotherapy for extensive stage disease is usually given for 4-6 cycles, with imaging performed every 2-3 cycles. MRI of the brain with contrast is also part of the staging workup for extensive stage small cell lung cancer. Prophylactic cranial irradiation (PCI) is a standard treatment for extensive stage small cell lung cancer patients without brain metastases on MRI to lower the risk of developing brain metastases (40.4% to 14.6% over 1 year in extensive stage).16 The standard dose, like PCI in limited stage, is 2500 cGy given in 250 cGy fractions over 10 treatments, and includes the entire brain down to the level of the C2 vertebra. When patients with small cell lung cancer actually develop brain metastases, whole brain radiation (WBRT) is the recommended radiation treatment method, for a total dose of 3000 cGy given in 300 cGy fractions over 10 treatments. If patients have a good performance status and have an estimated survival of 6 months or more, some patients can be treated with a longer fractionation dose of 3750 cGy in 250 cGy fractions over 15 treatments. Patients with extensive stage small cell lung cancer are generally not cured with chemotherapy or radiation therapy. The purpose of treatment is to improve quality of life and symptoms as well as prolong survival. Approximately 60-70% of patients will respond to chemotherapy the first time with their cancer shrinking. Unfortunately, responses may not last for long and subsequent therapy may depend on the interval between therapy stopping and the cancer growing again. For patients who undergo treatment less than 5% of patients are alive at 5 years. Life expectancy is usually less than 2-3 months and often only a few weeks for patients who elect not to have any treatment. Given the limited number of drugs currently approved for small cell lung cancer, not due to lack of studies but due to lack of success, clinical trials remain critical to advance therapy for this disease. A clinical trial is a research program designed to evaluate whether a new drug is effective in the treatment of a particular disease. Some trials may compare a new treatment to the current standard of care or add a treatment to the standard of care. Some people may not wish to participate in a clinical trial for fear of not receiving adequate treatment for their disease, however this is not the case in clinical trials involving cancer patients. Patients may speak with their doctor about a clinical trial, ask questions, and make a decision if the trial is a reasonable choice for their disease. Sometimes a patient may not be able to participate in a trial because of other comorbid illnesses and the doctor would know if this was the case. 1. Siegel RL, Miller KD, Jemal A. Cancer statistics, 2016. CA: a cancer journal for clinicians. 2016;66(1):7-30. 2. Beckles MA, Spiro SG, Colice GL, Rudd RM. The physiologic evaluation of patients with lung cancer being considered for resectional surgery. Chest. 2003;123(1 Suppl):105S-114S. 3. Jackman DM, Johnson BE. 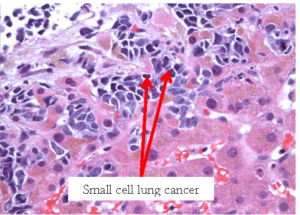 Small-cell lung cancer. Lancet. 2005;366(9494):1385-1396. 4. Yang P, Allen MS, Aubry MC, et al. Clinical features of 5,628 primary lung cancer patients: experience at Mayo Clinic from 1997 to 2003. Chest. 2005;128(1):452-462. 5. Chute CG, Greenberg ER, Baron J, Korson R, Baker J, Yates J. Presenting conditions of 1539 population-based lung cancer patients by cell type and stage in New Hampshire and Vermont. Cancer. 1985;56(8):2107-2111. 6. Byers LA, Rudin CM. Small cell lung cancer: where do we go from here? Cancer. 2015;121(5):664-672. 7. National Comprehensive Cancer Network (NCCN). NCCN Clinical Practice Guidelines in Oncology. Small Cell Lung Cancer Version 2.2017. 2016 Sept 15;National Comprehensive Cancer Network. [Abstract available at https://www.nccn.org/professionals/physician_gls/pdf/sclc.pdf. 8. Videtic GM, Stitt LW, Dar AR, et al. Continued cigarette smoking by patients receiving concurrent chemoradiotherapy for limited-stage small-cell lung cancer is associated with decreased survival. J Clin Oncol. 2003;21(8):1544-9. 9. Sundstrom S, Bremnes RM, Kaasa S, et al. Cisplatin and etoposide regimen is superior to cyclophosphamide, epirubicin, and vincristine regimen in small-cell lung cancer: results from a randomized phase III trial with 5 years’ follow-up. Journal of clinical oncology : official journal of the American Society of Clinical Oncology. 2002;20(24):4665-4672. 10. Turrisi AT, 3rd, Kim K, Blum R, et al. Twice-daily compared with once-daily thoracic radiotherapy in limited small-cell lung cancer treated concurrently with cisplatin and etoposide. The New England journal of medicine. 1999;340(4):265-271. 11. Travis WD. Advances in neuroendocrine lung tumors. Annals of oncology : official journal of the European Society for Medical Oncology / ESMO. 2010;21 Suppl 7:vii65-71. 12. Shioyama Y, Nakamura K, Sasaki T, et al. Clinical results of stereotactic body radiotherapy for Stage I small-cell lung cancer: a single institutional experience. J Radiat Res. 2013;54(1):108-112. 13. Auperin A, Arriagada R, Pignon JP, et al. Prophylactic cranial irradiation for patients with small-cell lung cancer in complete remission. Prophylactic Cranial Irradiation Overview Collaborative Group. The New England journal of medicine. 1999;341(7):476-484. 14. Chang JY, Bradley JD, Govindan R, Komaki R. Toxicity of Normal Tissue. In: Halperin EC, Perez CA, Brady LW, eds. Principles and Practice of Radiation Oncology. Philadelphia, PA: Lippincott Williams & Wilkins; 2008:1102-4. 15. Palma DA, Warner A, Louie AV, Senan S, Slotman B, Rodrigues GB. Thoracic Radiotherapy for Extensive Stage Small-Cell Lung Cancer: A Meta-Analysis. Clinical lung cancer. 2016;17(4):239-244. 16. Slotman B, Faivre-Finn C, Kramer G, et al. Prophylactic cranial irradiation in extensive small-cell lung cancer. The New England journal of medicine. 2007;357(7):664-672.